Pick up from Hotel Village Changi-Walk through Chinatown-Walk through Little India-Walking tour of the Marina Bay Waterfront-Singapore Flier-Merlion park-Marina Bay Sands SkyPark- Garden by the Bay- Spectra-A Light & Water Show-Drop off at Hotel Village Changi. 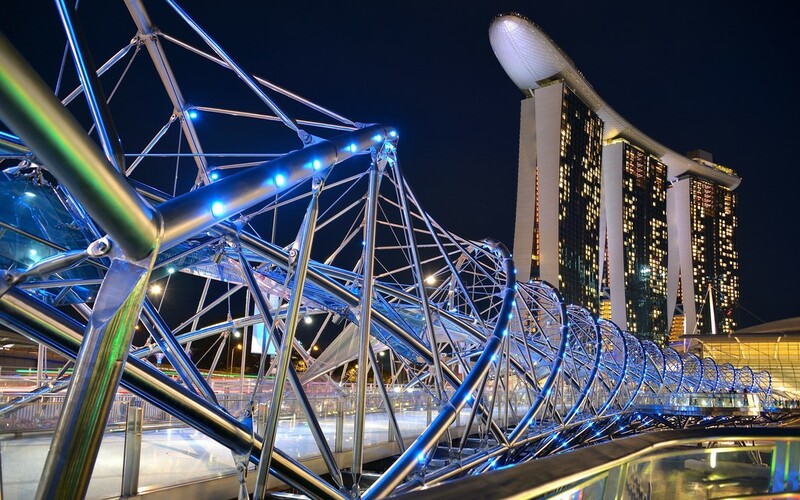 This complementary tour does not include Singapore flyer ride ticket, the entry ticket to Marina Bay Sands Sky Park, Cloud forest, and Flower dome. 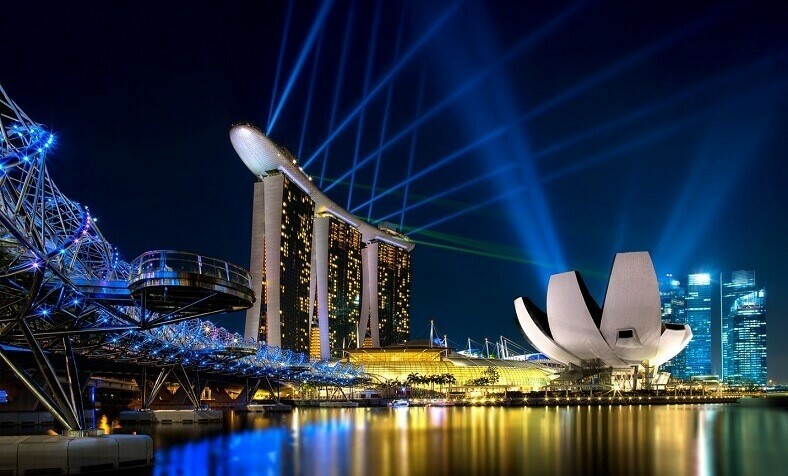 Since Marina Bay has several worth watch attractions, there is a possibility of missing few of the above mentioned sites in one-day tour. 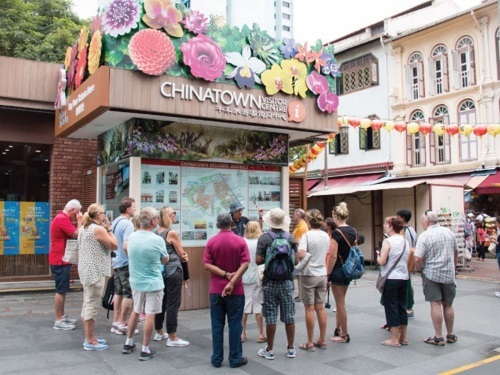 Unearth the secrets of Chinatown with one-hour walk-through the ethnic precinct. Walk along the narrow streets between traditional shop houses and you can be sure that you're tracing the footsteps of migrants from an era long-gone. Let your guide tell you stories of these migrants and their hardships as coolies and labourers who lived in cramped spaces and worked for long hours. Along the way, discover the traditional trades of woodwork, Chinese medical halls, tea houses, calligraphy galleries, and bakeries that still survive to this day. Immerse yourself in the many streets with fascinating names, and allow your guide to share their origins with you. Lastly, visit the Buddha Tooth Relic temple-a testament to the multi-cultural and multi-religious society of Singapore. The Chinese make up a majority of the population in Singapore. Chinatown is, therefore, a district full of valuable historical and architectural monuments. There are Chinese, Hindu and Moslem places of worship in this locality. Amuse your senses and savour the magic in the ethnic precinct of Little India on this walking tour. Begin at the Indian Heritage Centre and go into the narrow streets between pre-war conserved shop houses, and be dazzled by vendors hawking traditional wares like spices, gold, saris, and flower garlands. Walk to the Little India Arcade, where the bazaars will make you feel like you've been transported to New Delhi. Immerse yourself in the lively atmosphere while you browse silk saris, hand-made perfumes, and even try getting a henna tattoo from the locals! Navigate the market with its stalls of fruits and fresh meat while you absorb the sights and sounds in it. Marina Bay Singapore is an entertainment, commercial and residential area of city built on reclaimed land. Marina Bay Waterfront Promenade is a 3.5 km along-the-bay walkway that brings people across many attractions at Marina Centre, Collyer Quay and the Bayfront. Some of the major Marina Bay attractions are Marina Bay Boat Ride, Helix Bridge connecting Marina Centre to Marina South, Gardens by the Bay, Art Science Museum, Marina Bay Sands Sky Park, Merlion park, Singapore Flyer, Marina Bay Sands Casino, Esplanade - Theatres on the Bay, Spectra at Marina Bay Sands, Marina Bay Golf Course etc. 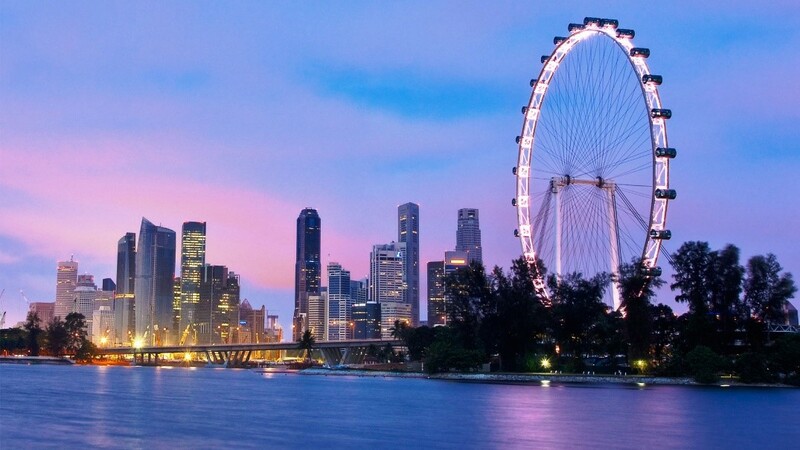 At 165 metres tall, Singapore Flyer is a masterpiece of urban architecture and engineering that showcases not only the mesmerizing cosmopolitan cityscape of the tropical Lion City, but even the surrounding islands of Indonesia and parts of Malaysia in all their glory. In addition to offering panoramic views of Singapore's cosmopolitan cityscape, guests can also indulge in a flute of champagne, or savour the iconic Singapore Sling whilst hosted in a special themed capsule. Diners seeking both privacy and luxury can opt for a multi-sensory treat unlike any other with our Premium Sky Dining Flight, complete with a four-course dinner and an in-flight host. It promises more than just a view, but a panorama that captures Marina Bay's skyline with a glimpse of neighbouring Malaysia and Indonesia. Each revolution takes approximately 30 minutes to complete. Half-fish and half-lion, the iconic Merlion resides at the waterfront Merlion Park. The body symbolises Singapore's humble beginnings as a fishing village when it was called Temasek, meaning 'sea town' in Old Javanese. Its head represents Singapore's original name, Singapura, or 'lion city' in Malay. Today, you can glimpse this legend at Merlion Park. 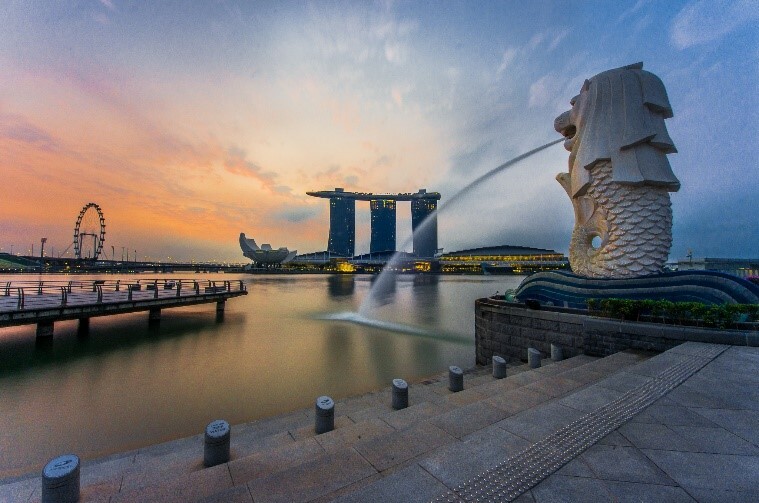 Spouting water from its mouth, the Merlion statue stands tall at 8.6 metres and weighs 70 tonnes. This icon is a 'must-see' for tourists visiting Singapore, similar to other significant landmarks around the world. The park also houses a smaller Merlion statue. Known as the 'Merlion cub', it stands at 2 metres tall and weighs three tonnes. An Observation Deck at 57 levels above the heart of the city, it offers a taste of the highlife by viewing Singapore from above. This large wooden decked area on top of iconic Marina Bay Sands hotel at the edge of the city's harbour offers a 360-degree panorama, with nothing but a sheet of glass and a few wires between you and the view. 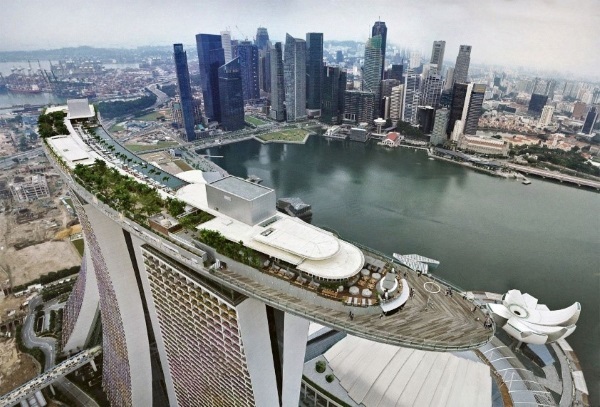 Sitting on top of the massive, 3-pronged hotel that overlooks the bay and practically puts Singapore on the map, Marina Bay Sands SkyPark has been one of the most popular attractions in Singapore since it opened at the turn of the decade. The visitors may cherish lunch at The Shoppes at Marina Bay Sands. Lunch/ refreshment is not included in the complementary tour. 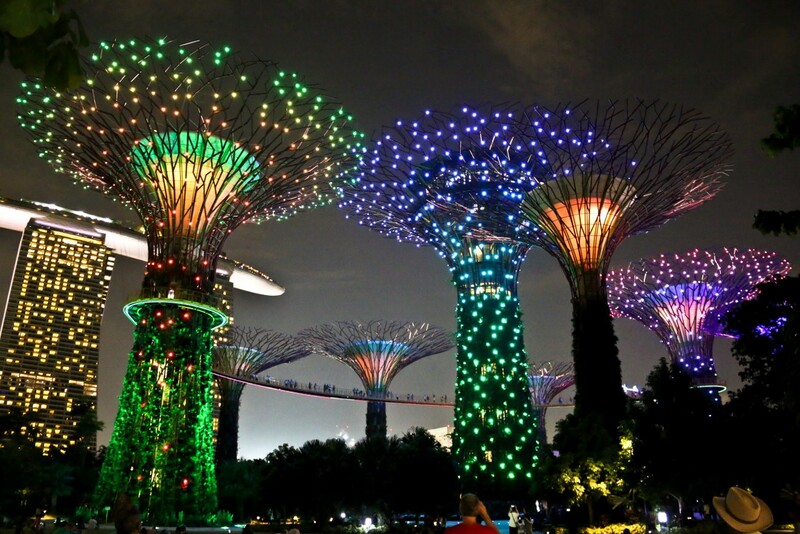 A huge, colourful, futuristic park in the bay area of Singapore, it spans a total of 101 hectares of prime land at the heart of Singapore's new downtown - Marina Bay. Gardens by the Bay has some massive artificial trees joined by a sky walking bridge and two huge glass greenhouse botanical gardens the Cloud Forest and Flower Dome. Both the glass conservatories are air conditioned. Cloud Forest (smaller dome) is a glass conservatory comprising of plants that are native to mountainous regions which are 1000 to 3500 meters above sea level. 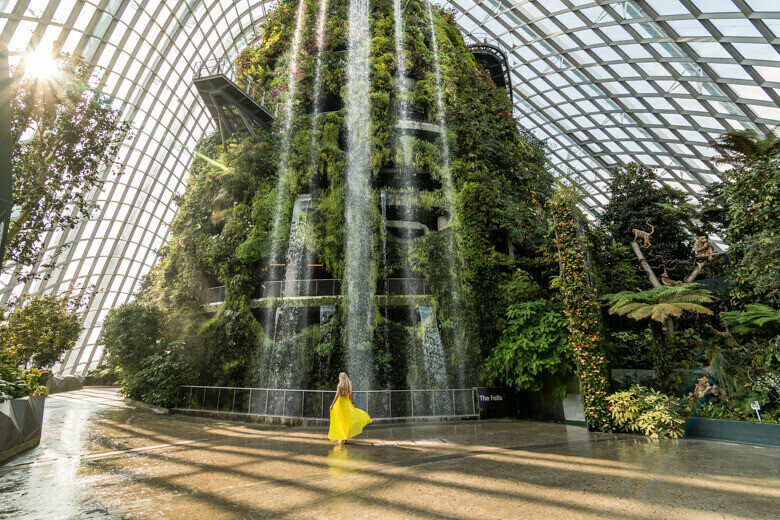 Within the enclosed compound, a 35-metre tall mountain is veiled in mist and covered in lush vegetation amidst the high indoor waterfall. The Flower Dome (bigger dome) is a glass conservatory with a selection of plants from the Mediterranean and semi-arid subtropical regions like Australia, Central Chile, California and South Africa. The park is illuminated by a spectacular light show at 7:45 pm and 8:45 pm. Entry to Gardens by the Bay is absolutely free except for the two conservatories (Cloud forest and Flower dome). Conservatories (Cloud forest and Flower dome). Spectra - A Light & Water Show, Marina Bay Sands: A wonderful spectacle of dancing, shimmering rainbows of coloured lights reflecting off of water droplets and fountains and accompanied by an exciting musical score makes this a great outdoor evening experience! The screen out of fountains and high speed water sprays and play colourful visual arts on it. The theme is mostly related to Singapore and local items. The show timings are 8:00 pm and 9:00 pm daily.